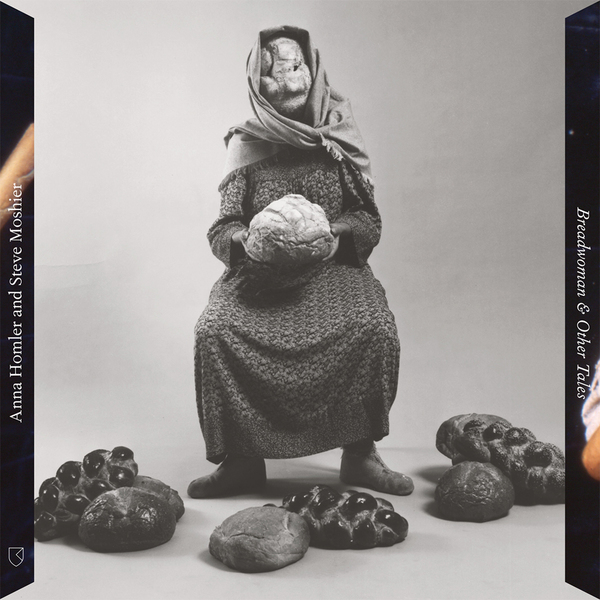 Spellbinding transmission from the esoteric melting pot of early ’80s L.A.; an expanded reissue of the eponymous debut release by Anna Homler & Steve Moshier’s sound art duo, Breadwoman, including two bonus, previously unreleased pieces. First kneaded in 1982 by performance artist Anna Homler, Breadwoman arose as a “being who exists outside of time”, intersecting various strands of L.A.’s art scene - gallery culture, DIY avant-garde, meaning-making mysticism - with a combination of gauzy electronics, glossolalic vocalese, and a costume made out of bread. You can certainly colour us beguiled at Breadwoman & Other Tales, presenting the original tape’s alien song cycle - from the primordial shuffle and curiously Japanese-sounding vocalese of Ee Chê, thru the floating prisms of Oo Nu Dah, to the Rashad Becker-esque electronics of Giyah and kosmiche crème of Yesh’ Te - whilst the two bonus tracks angle far, far-out into stunning cinematic abstraction sounding like Helge Sten scoring a Lynch flick with the 12 minute Sirens, whereas Celestial Ash scries a precedent to everything from Enya and Julia Holter to Anna Caragnano & Donato Dozzy’s Sintetizzatrice. Can easily predict this becoming an end-of-year favourite. Recommended!